DD Form 2959 is a U.S. Department of Defense form also known as the "Breach Of Personally Identifiable Information (pii) Report". 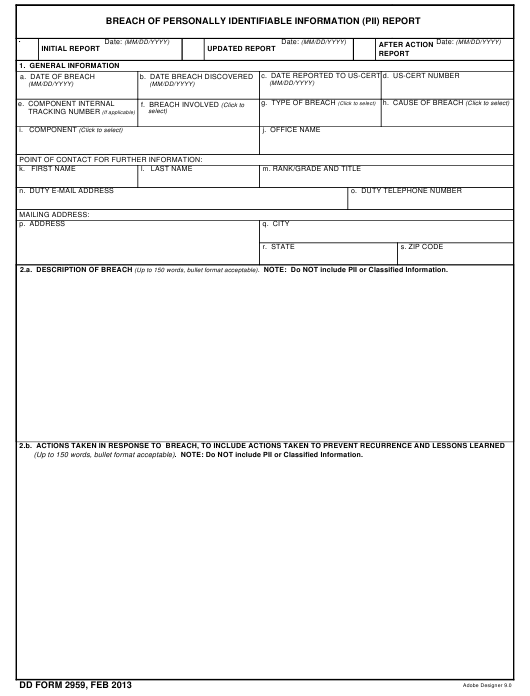 The latest edition of the form was released in February 1, 2013 and is available for digital filing. Download an up-to-date DD Form 2959 in PDF-format down below or look it up on the U.S. Department of Defense Forms website. b. WERE AFFECTED INDIVIDUALS NOTIFIED? (5) If applicable, was credit monitoring offered? If yes, was issuing bank notified? NOTE: Do NOT include PII or Classified Information. Select Initial, Updated, or After Action Report and enter the date. provide further explanation in the notes section of the report. modifications. List any findings resulting from the investigation of the breach. discovered by a DoD employee, military member, or DoD contractor. individuals listed, enter the number of individuals affected by the breach. Do not include an individual in more than one category. justification, continue text in 6.c., Additional Notes. when the breach was reported. days? Check "Yes" or "No". notification letters will be sent. Email, Info Dissemination, Paper Records, or Equipment. (5) Was credit monitoring offered? Select "Yes" or "No". Note: This is a risk of harm based decision to be made by the DoD Component. (6) If "Yes", enter the number of individuals offered credit monitoring. 5. SELECT ALL THE FOLLOWING THAT APPLY TO THIS BREACH. Check at least one box from the options given. If you need to use the "Other"
Improper Security Settings, or Other. option, you must specify other equipment involved. your Component, enter the Office/Name in block 1.j (i.e., if "OSD/JS"
answer each associated question by selecting from the drop-down options. additional details regarding the breach. selected, choose either "Yes" or "No" for all of the questions. acceptable). Note: Do not include PII or classified information. the breach. If the inquiry type is "Other", please describe. Select one: What is the overall risk level associated with this breach? individual if the PII is misused. c. Additional Notes. This field can be used to convey additional information.